I remember when I first started eating “clean” – it was right after I had my first son, almost 11 years ago. I had just had a baby, and was having a really hard time adjusting to the physical changes my body had gone through. Instead of appreciating what a miracle my body had just performed, I couldn’t wait to lose weight and “lean-out”. I became pickier about what I ate and exercise sessions got longer and longer, until I was spending no less than 2 hours at the gym each day. After giving birth, my menstrual cycles become normal (even while breastfeeding). This was actually pretty miraculous since I have struggled with irregular cycles since menarche. But as I became more restrictive about food and more obsessive about exercise, I lost menstruation completely. What I wouldn’t give to go back and change that. But of course I can’t. And in a lot of ways, I wouldn’t. If I did, I may not have my 6 year old son, brought to us through adoption. I also wouldn’t have learned vital and life-changing lessons through what eventually became a full blown battle with Orthorexia and an exercise addiction. Hitting rock bottom, I was left with 5 foods I would allow myself to eat, multiple injuries (most notably a pelvic stress fracture) and a really sick, weak body and mind. I really, really, really wish I could have turned things around far before it got that bad, but food had a lot to teach me before I was ready to let go. Quite honestly, I had no idea I could change it – that’s how eating disorders work. I completely believed that I had to do it; what was once a choice was now a compulsion and I felt very little control. When I did decide to let go, I didn’t let go all at once. I still wanted some sort of diet that would provide control and structure but wouldn’t make me feel anxious. I’ll just eat vegan…plant based…OK, just dairy free…grain free?…what if I just didn’t eat sugar…maybe just monitor carbs. I figured out pretty quick that any amount of rules or labels or structure just made me anxious because when there are rules around food, there are rules around social settings, traveling, holidays…LIFE. Making peace with food doesn’t make room for rules. Letting go means LETTING GO. And once you let go you realize just how heavy it was…and you finally feel free. There is nothing that could convince me to ever go back that. 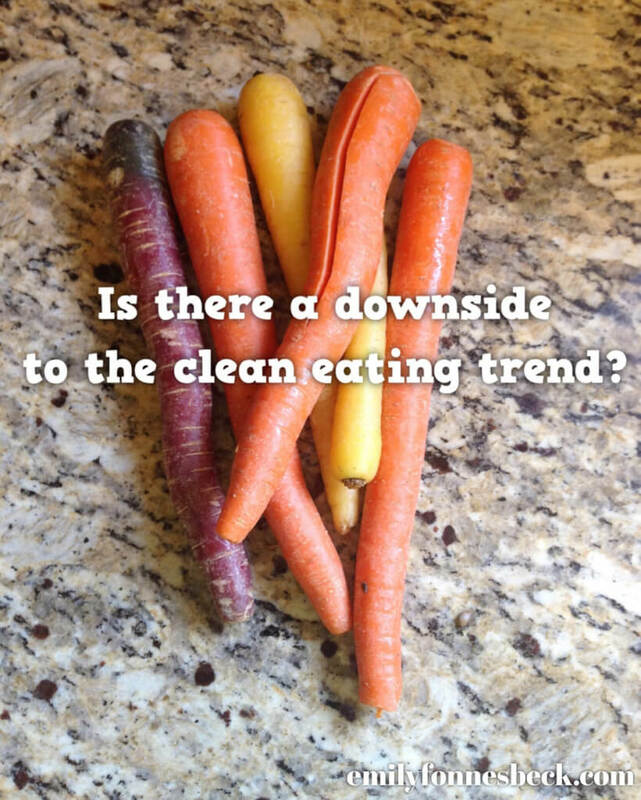 This is why I recommend avoiding the term “clean eating”. What might seem innocent to some was my first step to complete destruction, which has been a very long and very, very hard recovery. Obviously your experience may not be as extreme as mine. However, it has become increasingly obvious to me through current research, my personal experiences as well as my professional work that diets (any sort of food manipulation or restriction) and food plans CAUSE disordered eating. Research shows that dieters are more likely to feel depressed and anxious and to engage in disordered eating patterns. While proponents of clean eating claim it not to be a diet but a lifestyle change, I would just call it a lifetime diet. The term “clean eating” (and honestly “healthy eating” for that matter) is not at all quantifiable with varying definitions depending on the person – another reason to be wary of it’s validity. It also feels really elitist to me and only one more way to compare, judge, assume, encourage pride and feed ego. While I certainly encourage choosing wholesome, nourishing and nutritious foods, why do we need to call it “clean” or attach any label to it for that matter? Making peace with food encourages for your emotional reaction to be the same no matter what you choose to eat – you aren’t patting yourself on the back for eating carrots or hitting yourself over the head for eating cake (and I believe the former to be JUST as, if not more, important than the latter). No pride or ego, no shame or guilt…just trust, confidence and authenticity. So while nutritious food is important, I encourage a big picture approach looking at food patterns overall rather than scrutinizing each and every day, meal, food and/or ingredient. I also recommend increasing variety of and from food groups, which can often be limited on certain clean eating plans and may encourage “cheating” on forbidden foods (read: overeating, binging or feeling guilty after eating); another problematic outcome of the clean eating trend. I think we blame food way too much for our health concerns, given that health is multifactorial. So no, we can’t blame sugar or gluten or kale or flaxseed, but it’s easy to develop an all-or-nothing mentality around food. We CAN blame the idea that we are broken and need to be fixed. The idea that a new mom needs her old body back. The idea that men must have a certain physique. The idea that we can’t trust ourselves with sugar. The idea that we are somehow morally responsible for eating “bad”. The idea that if we just try hard enough we can look a certain way. The idea that if we don’t look a certain way, we aren’t trying hard enough. We absolutely can blame the clean eating movement and the diet mentality because we see the repercussions over and over and over again. I’m not alone in my concern. Below are links to interesting articles from a few fellow Registered Dietitians. I encourage you to take time to read their perspectives and reflect on what verbiage you use in describing food. While we may assume it’s just words, those words can carry a lot of power so be sure to speak with integrity; mean what you say and say what you mean. Well worth a listen. I particularly like how Aaron compares Clean Eating to Hydra, ha! Great overview of some of the potential psychological downsides of the clean eating trend, especially among children. Ultimately, it’s up to each of us to decide what inspires us and exhausts us. Regular, adequate and consistent nourishment is no doubt of great importance but so is our mental and emotional health. I maintain that TRUE health and wellness comes from making peace with ourselves.